... a supercharged set of skills that enables sales, marketing and customer service teams to engage with clients on a completely new level. Salecology draws insights from the fields of psychology, sociology, neuro-linguistic programming, neuroscience and sales to analyse how people buy and what makes a successful negotiation. Psychology reveals how personality and intellect affect behaviour, sociology shows how people respond in group situations and to social pressure and trends, neuro-linguistic programming shows how to influence anybody anywhere through using the dynamics between mind, language and behavior. 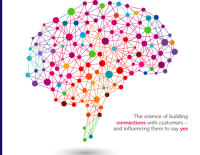 Neuroscience has uncovered how the brain functions, both consciously and unconsciously, and the art of selling shows how to present and customise your message according to how the customer needs it. Salecology brings all of this together within a proven sales process to exert an unprecedented influence on customer decision-making. With Salecology you will learn that most decision-making is not based on rational thought, but subconsciously. We will provide you the tools and techniques to tailor your sales approach, presentations and negotiation to connect with the customer on a subconscious level and influence them to say “Yes”.